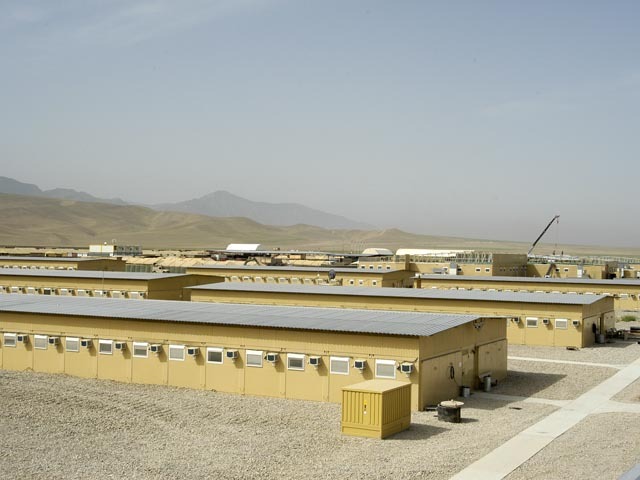 Camp Marmal in Mazar-e Sharif got a complete paved military camp with complete infrastructure for approximately 3000 soldiers. SÄBU got the order to produce large parts of the buildings, to transport them to Afghanistan within an agreed time, assemble the buildings and hand them over to the armed forces ready to use. SÄBU delivered a complete field hospital with all medical equipment, a catering area with canteen kitchen and the according equipment as well as the necessary storage and cooling rooms and further special buildings. The dismantled, especially stable, bulletproof container units have predominantly been delivered to Afghanistan by train (6000 km) to keep down transport costs. After collection of the goods at SÄBU Gransee, the truck transport to Berlin and train consignment, a series of exceptional logistic problems had to be solved before the military containers arrived in Afghanistan after 3 months. Further goods have been dispatched by air like expensive medical equipment, air conditioning units and miscellaneous other equipment.